I can’t say for sure who first exposed me to comic books, but I know I was young—maybe five or six—and that I was instantly addicted. In the early 1960s DC was king of the spinner racks and just about every male under the age of thirteen worshipped the company’s incontestable superstars, Superman and Batman. But the two titles I loved above all others were Green Lantern (will + imagination = manifestation. A perfect recipe for living one’s life at any age) and DC’s crown jewel, Justice League of America. All your favorite heroes together in one book? How could anyone resist? I certainly couldn’t. Looking back, those early stories by Gardner Fox and Mike Sekowsky can seem almost primitive, lacking in many elements we’ve come to identify with modern comics (strong characterization first and foremost: If you just read the dialogue, you couldn’t tell Green Arrow from Wonder Woman). But what they may have lacked in sophistication, they made up for in charm, clever plotting and, most important, unbridled imagination. Those early JLA stories opened my young mind to the limitless possibilities of a universe filled with gods and aliens, sorcerers and spaceships, other dimensions and parallel worlds. Just as important, the stories were kid-friendly—something that seems almost shocking given today’s hard-edged superhero universes—written with an innocence and sense of wonder that any child (or open-hearted adult) could easily understand and relate to. As I grew older, the League grew with me. In the 1970s, a new generation of writers and artists brought a sharper edge, and a more mature palette, to the stories, while always staying true to the book’s Fox-Sekowsky roots. I was fortunate enough to enter the world of the Justice League in late 1986 when editor Andy Helfer asked me to wrap up the adventures of the so-called Detroit League. That was supposed to be a one-off gig, but I soon found myself neck-deep in League adventures, working with Andy, co-writer Keith Giffen and an army of artists, led by Kevin Maguire, on a five year journey through a variety of Justice League International monthlies and mini-series. It was one of the happiest times of my creative life. In the years since, I’ve been lucky enough to chronicle multiple incarnations of the League, from the resurrected clones of Justice League 3000 to the monsters and magicians of Justice League Dark and the alternate reality of Justice League: Gods and Monsters. 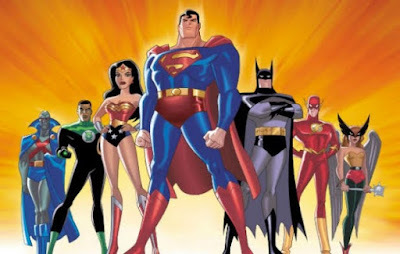 I’ve also had the pleasure of writing the JL’s animated exploits in multiple episodes of Justice League Unlimited and Batman: The Brave and the Bold—and I can’t help wondering what my League-loving younger self would say if I could travel back in time and tell him that, one day, he’d be crafting the adventures of his favorite heroes. I suspect he’d be amazed, delighted and profoundly grateful—which is exactly how I feel as I sit here writing this. I think you should do a Justice Society book. I miss those guys. I might wait a little while. Things appear...chaotic there right now. Personally, I like the JSA more than the Justice League. I have found that at both Marvel and DC, there premiere teams (JLA and Avengers) are less interesting to me than the variations. Especially when the characters are only in those books. Lets be honest, all the really good character stuff (or most) won't happen on the team they belong to, it will be in their own book. That may be part of why my favorite Justice league eras are the Justice League Detroit and JLI. 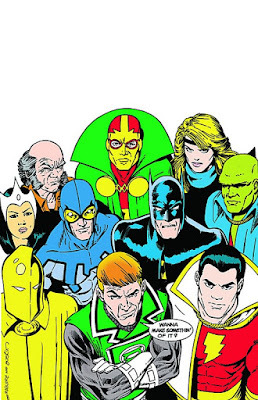 I like the the variations, JLI, Justice Society (I know they were the original, but they have shifted a lot since then), X-Men, Defenders, Invaders, New Teen Titans, and so on. This may be why I would love a Dematteis series about the Invaders... after the War. Or even during. However, I would be on board for a Dematteis JSA series. I think you'll have to wait a year, though. I am pretty sure that Geoff Johns, in the last half of his 'Doomsday Clock' series, will bring the JSA back to save the day. Unfortunately, I also think Johns may be returning to the team. Sorry Dematteis, I just can't get get behind taking that team away from Johns. It is always amazing when he rights it. Geoff a terrific writer and a really good guy, so I have no problem with that! I only met him once, but he did certainly seem like a nice guy. Also, was clearly someone who really loved comics, and that was from only 5-10 minutes. If you haven't read his original JSA run, I would recommend it. It is up there competing with Brubaker's Captain America, Peter David's X-Factor and Captain Marvel, as the best ongoing series of the decade. Now, how about this Dematteis Invaders project. Y'know, Jack, once you start running Marvel, I'll be up to my neck in work! Well, Peter Parker, I hear, recently became teh Bugle's tech editor for notining an error when having an argument with Joe Robertson. Since no newsroom on Earth would do that (and people get hired for some weird reasons), I assume that is a Marvel thing that was just drawn from from personal experience. So, since I noticed THAT error, I assume I will be come the new Spider-Man editor. It is unorthodox method, but I suppose it encourages accuracy. SO the process has begun. I wonder who got the Captain America editor's job back in the 80s, when some hotshot kid from Brooklyn, wrote that Steve Rogers got drunk. I assume the editor, assistant editor, and writer were all replaced with the artist and inker getting pay cuts, and the letter a strongly worded talking too. Tell Dan Slott our first meeting will involve the words 'marriage' and 'restore'... also 'catipult.' Gotta keep these people on their toes. You just try to get those juices flowing, I don't need my first hire stalling out, especially with that work load. "Only one man remembers the Parker-Watson marriage. Discover the unfathomable secret of the being known only as...Catapult!" That's some pretty brilliant maneuvering on your part. Maybe your true calling is editing DAREDEVIL! The catapult is more of a...what is the Madison Avenue term for a threat? Job incentive, that's right. You can't have these people thinking they can have their own opinions, on YOUR ideas, in YOUR office. As for the chief thing, you can call me that all you want, as long as you light my cigar/cigarette, or pour my whiskey as you do it. Which reminds me, if ever there was a lost scene from Marvel, that needed to be written, it is Ben Urich and J. Jonah Jameson bonding over New York's smoking ban. JJJ: What do you mean I can't smoke in my own business? JJJ: what am I supposed to do, chew that damn gum while demanding deadlines!? Ben: YEA...or somebody, definitely somebody. Peter: Hey guys, I don't know what you did, but my sinuses are much clearer, the air is fresher. Ben and JJJ: GET THE HELL OUT OF HERE, PARKER! Ben:I will bun you shutterbug. Ben: Now I feel bad. Ben: Yeah, I guess I didn't think about that. JJJ: wanna head downstairs and smoke in the freezing cold? Ben: No, I want to smoke at my nice warm desk, but that isn't an option anymore. I'll bum you a cigarette. JJJ: You know Ben, that deadline just may be a bit more flexible than I thought. That and the suicide cult that has to have sprung up in the Marvel U. Think about it, there have been 10 years+ of massive crossover events with giant threats. Some times more than one, usually centered in or around NYC. Because of the sliding time scale, that is like one a month. There have to be so many people moving out of the city or saying the end is night, and joining a suicide cult. And yeah, with the compressed timeline you're right, NYC undergoes a massive attack every five minutes or so. At some point, the heroes are going to be so glad to see that rare villain with a smaller focus, like revenge or money, they'll let them slide with a warning!